Before I get too far into the review I want to let everyone know what my experience with jerk sauce is. Walkerswood and the product I am reviewing right now. When I first tried walkerswood jerk seasoning it wasn’t really my favorite although I liked trying something new. I was excited to try this so that I could compare it to the walkerswood and get a better idea of whether or not I like jerk sauces. The label is not bad, but not really anything that makes me want to buy it either, and the sauce itself is a thick greenish brown color that looks almost gritty with all the spices in it (don’t worry its not). The smell was similar to the other jerk seasoning that I had which is sweet. Both in the smell and taste (straight from the bottle) the first thing I notice is the molasses (even though it’s only an ingredient in another ingredient and probably don’t have a lot in it), ginger, and brown sugar, it has almost a nutmeg type of flavor to it. All the ingredients are well blended and I actually really liked the flavor of it, but it’s not something that I would think to match up with chicken, or really anything. I guess the point is that it’s different and you have to be willing to try something new if you have never had a jerk seasoning before. The instructions say to marinade over night and then grill or cook as usual. I know that traditional jerk cooking is done by method of smoking so that’s what I did. The chicken turned out great, I expected it to be dry having never smoked anything other than jerky but it wasn’t at all. The flavor on the chicken wasn’t very strong, I tasted mostly the smokiness and the Flaming Joes was more of a background flavor that gave it a little sweetness after every bite that was a lot better than if the chicken was just flavored with the seasoning alone. The next day (today) I decided to follow the directions on the bottle and cook chicken as usual. I got plenty of chicken when I marinated it for the smoker to do a couple pieces in the oven also, and even though they marinated a day longer than the first the flavor wasn’t powerful but it did taste like the jerk seasoning and nothing else, which is what I tasted straight from the bottle and thought “its good but I wouldn’t want it with chicken”. If you do decide to try this product do it the way it’s meant to be done and smoke it, it takes awhile (about an hour and a half) but it’s worth it. all in all I would give the sauce a 5/10 because it wasn’t so good that I will buy it again but I will definitely experiment with other jerk seasonings and similar products, it was better in my opinion than walkerswood which I have heard from so many people is the best of the best when it comes to jerk sauces. The heat on this one is mild, in the oven I couldn’t taste any heat at all, but the smoked pieces built up more towards the end, I don’t know why that is but it’s one more reason to smoke it rather than to bake it. One last thing that I am yet to try is putting it on some vegetables which are recommended on the bottle. When I tasted it straight and thought that it wouldn’t really be the best with chicken, vegetables are what I would of thought to put it on instead so that should turn out good. To finish out the review I want to note that even though I would only give the product I 5/10 that could just be because jerk seasoning aren’t my cup of tea. If you like jerk seasonings it is worth buying a bottle to judge for yourself. Ingredients: key lime juice, soybean oil, soy sauce, green onion, Worcestershire sauce (vinegar, water, corn syrup, salt, molasses, carmel color, spices, garlic, natural flavorings, anchovies, tamarind, dextrin, and sulfating agents), ginger, habanero pepper, brown sugar, garlic, cilantro, chili powder, spices, xanthan gum, guar gum, sodium alginate. Ahhh Haven’t seen that face in a while! THT met Flaming Joe awhile back at one of the Industry shows, can’t exactly remember if it was Fiery Foods or Zest Fest but we loved Joe! He’s a great guy and was just starting out so its nice to see he’s got some stuff coming to fruition. Anyone who’s interested should check out his website, he’s got a good story on there. As far as the review goes, Im not one for ANYTHING that is smoked or has a real “smoky” flavor so I wouldn’t try it the way it is recomended but I do like a good Jerk Sauce so I’d play around and see how I could make it work. Good luck Joe and nice review Justin! i never thought about making jerky with it, ill have to try that. I have had a hard time reaching him.I sent an email but that does not seem to be a active email. Do you know how to contact him for placing orders? Hey Justin, good review. I’ve had the Walkerswood jerk marinade, and I didn’t like it near as much as the Walkerswood jerk paste. It’s not nearly as liquid. On the bottle is just says “Traditional jerk seasoning”. It’s in a kind-of conical bottle. Slather the chicken in the paste, making sure to get lots under the skin, and put it all in the fridge over night. Smoke or grill it the next day. Excellent flavor and a little heat. 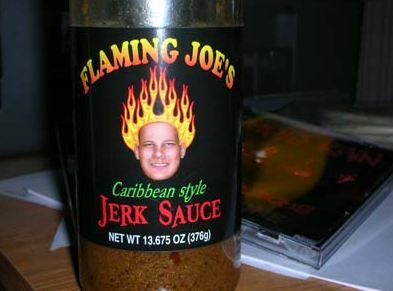 For more heat, get Grace jerk paste. It’s called “Grace Jerk Seasoning Hot & Spicy”. Me and my buddy from Trinidad did that the other day and MAN! It was like eating a couple whole scotch bonnets with each drumstick! Still really good flavor though. That Walkerswood seasoning is what to use, not the thin, liquid-y marinade. Hey Justin, Great review!! I did a review on this sauce a while back. I guess you have to have a taste for a jerk sauce. I tried this sauce a few different ways…it worked great after marinating chicken breasts and grilling them…the flavor for me was a great jerk flavor…nothing too strong..I think it would work great for a jerky marinade. I will try it when we make jerky again. i had it right around 200-220 and yea it took a while but it was worth it! thanks for the tips and suggestion on grace jerk paste, sounds more to my likeing with the heat level so i will have to look it up. Good review Justin. 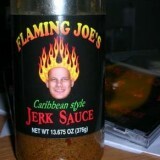 I wonder how Joe’s sauce would taste on shrimp? shrimp on skewers with pineapple, scallops, salmon, zuchini, portabellas – whatever. I will occassionally use my smoker and do wings and ribs as well. If we are too busy to cook we get a grocery store roast chicken & use it as dipping sauce. My neighbor did try it on his venison Jerky this winter and thought it was phenomenal. He devoured it before I could try any. We will be at Weekend of Fire, right next to Three Hot Tamales. I am in the process of getting my online ordering set up. I will post when it’s ready (hopefully tomorrow). Great review, good luck, looks like your making it! See you at WOF?? I finally have my online ordering enabled! To celebrate the launch of my store, for the next 2 weeks a prices have been discounted to $5 a bottle. My online order page has been turned on, finally. Special Launch Pricing – for the next 2 weeks prices have been discounted to $5 a bottle. See you all at WoF. Sweet! I just ordered myself a couple bottles. I love special discounted pricing!